Firstmonie is the official mobile banking and mobile money app from First Bank of Nigeria. Firstmonie is the fast, safe and convenient mobile financial service from First Bank. This app lets you send and receive money, buy airtime, make purchases and pay bills all from your mobile phone with or without a bank account. 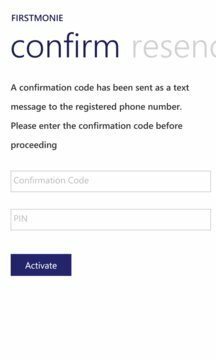 - On completion of the registration, you will receive an SMS on the registered phone number containing a Confirmation Code. Enter the code received and PIN in the App and click on Activate button. If you do not receive the Confirmation Code after 30minutes, click on the Resend Code button. - Upon successful activation, the transaction menu is displayed. - Fund your account and start transacting. Every transaction will require your PIN to authorize. NOTE: Before you use the app, please, refer to the “GET CHANNEL” section below. - On completion of the Activation, you will receive an SMS on the activated phone number. Enter the code received and PIN in the App and click on Activate button. If you do not receive the confirmation code after 30minutes, click on the Resend Code. NOTE: Visit any First Bank branch and complete the Mobile Banking form (Indicate “Mobile App” channel access on the form). Upon successful registration at the branch, refer to “Get Channel” section below before you download the app. Request for the exact details used as your surname, mother’s maiden name and date birth, as they will be required to configure the Mobile App on your phone/device. - On completion of the Activation, you will receive an SMS on the activated phone number. Enter the code received and PIN in the App and click on Activate button. If you do not receive the confirmation code after 30minutes, click on the Resend Code. - At any Firstmonie agent (from your nearest Firstmonie agent). - Directly from your First Bank account using your mobile phone. 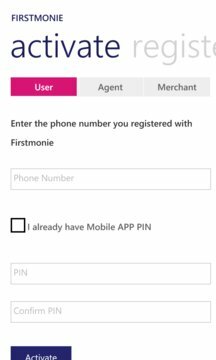 By downloading the Firstmonie App you agree to be bound by the license agreement which can be found at https://www.firstmonie.com . If you do not agree to the license agreement, do not download or use this application.